We’d love your help. Let us know what’s wrong with this preview of Oh, Oh, Baby Boy! by Janine Macbeth. Oh, Oh, Baby Boy! follows a newborn baby as he grows up, laughs, plays, causes mischief, and makes friends. His father's involvement is woven throughout the story, and depicted in nontraditional ways. The baby's father cuddles, bathes, and cooks with his son, and re-enters the story when the baby boy eventually becomes a father himself, bringing the journey full circle. 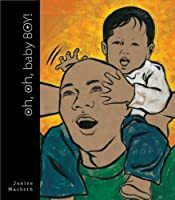 To ask other readers questions about Oh, Oh, Baby Boy!, please sign up. Be the first to ask a question about Oh, Oh, Baby Boy! Gorgeous illustrations, beautiful concept, but somehow falls short. Be sure to read it yourself before sharing with the very young as you might be having the where-do-babies-come-from talk before you planned. I include this title with others that are picture books intended for adults not children. Beautiful art, adorable father and child. There’s a visual depiction of birth on one page that may be startling to some parents. Very sweet book. Beautiful illustrations and story. I found this book after reading a piece on the author on colorlines.com that included a link to the author Janine Macbeth's kickstarter page and a video of her explaining her project. I bought the book for my partner's first Father's Day after our son was born. The author wanted to represent men in positive, nurturing parenting roles and not just as mother's occasional helper. Baby Boy's father is shown taking care of his young son. The book en Very sweet book. Beautiful illustrations and story. I found this book after reading a piece on the author on colorlines.com that included a link to the author Janine Macbeth's kickstarter page and a video of her explaining her project. I bought the book for my partner's first Father's Day after our son was born. The author wanted to represent men in positive, nurturing parenting roles and not just as mother's occasional helper. Baby Boy's father is shown taking care of his young son. The book ends with Baby Boy grown up holding his own baby boy with his father, now a grandfather, along side him. Very sweet. Baby Boy is also shown as a teen/young adult helping a older man off a bus under the words "strong, kind Baby Boy". I appreciate this detail because expands caring and nurturing beyond parent/child relationships to community relationships. The internet doesn't do this book much justice, in that the cover is actually part fabric (texture!) and has shiny letter (of which our son at his age is a big fan.) Also, another detail which is wonderful is the inside of the front cover has a cool blue and white pattern with silver foil stars. It is beautiful. It continues on the inside of the back cover along with a picture of Baby Boy being held by his mother. The pattern is her hair. I also love the page with Baby Boy running around with a mask and cape (who doesn't want to be a super hero at some point?). And I appreciate that his T-shirt has a Native American symbol and that this book puts forth a representation of a family of color living in a diverse community. The book Mom got Dad for Christmas to start the tradition of a book gift each Christmas or Christmas Eve. She heard about it from an event at Harvard Book Store and liked it because of its diversity and the unique perspective of showing dads in non-traditional or formerly motherly dominated roles. Heartwarming story in the book and of the publication of the book. Beautiful combination of sparse text and rich illustrations. Full cycle starting with one father and his baby boy as the baby boy grows and becomes a father himself sharing the magic with his father. Warning to squeamish parents, there is a picture of the second baby boy entering the world, look ahead and decide for yourselves. I was so impressed with this book! I hope an "Oh, Oh, Baby Girl" comes out, still with a father involved. For now, I'll change that word for my daughter. Highlights engaged fatherhood in a thoughtful way. Such lovely, simple, rhythmic, and straight forward text. Beautiful illustrations (one which shows, non-graphically, a baby's head crowning during birth), wonderful generically brown characters that anyone can see reflecting themselves. Boy, oh, boy! It's getting boisterous! Trivia About Oh, Oh, Baby Boy!